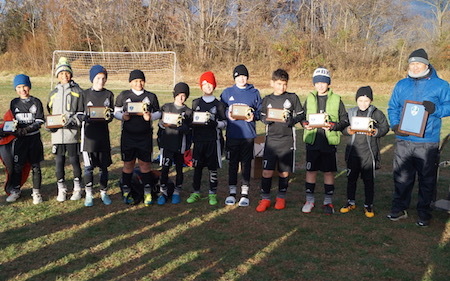 The U11B NJ Stallions 06 Barcelona EDP team traveled to Maryland in November to compete in the 2016 Bethesda Premer Cup, and finished as FINALISTS competing against top programs from Pennsylvania, Maryland, and Virginia. Over four games, the NJ Stallions boys finished with 2 wins, 1 draw and 1 loss. In game #1 they defeated the #3 Pennsylvania West ranked team, Beadling Boys 1-0, then in game #2 they fought hard to a 2-2 tie against a very talented Bethesda SC 06 Black team. In the semifinal game against Montgomery Academy Grey, they earned a 2-1 victory to get them into the Final where they eventually lost to SOCA Cville 06, a talented team from Virginia. Coach Antonio Meza had this to say about his team, "The players showed great character competing and finding a way to get to the final. Coming back from losing 1-0 to turning it around in the semifinal to win 2-1 was great to watch. We will build on this when we train this winter and prepare for the Spring season".